In a post on Game Informer‘s website today, they’ve detailed some of the ways that Madden 17 is making improvements over its predecessor, and from the sound of things they’re addressing a lot of player feedback with the latest iteration of the franchise in order to please fans and ultimately craft a more satisfying experience. 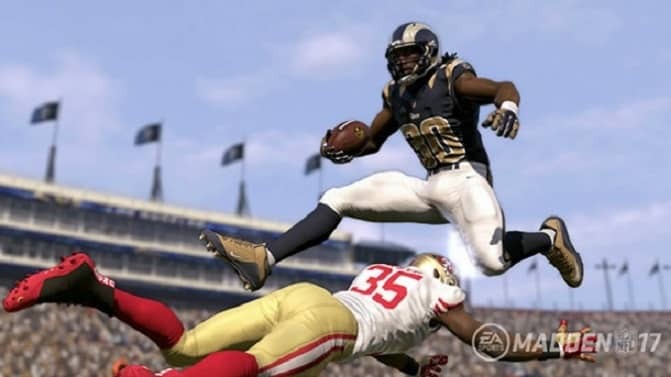 According to Madden 17 creative director Rex Dickson, one of the goals with this installment is to reduce the viability of money plays, so named because they typically have a high success rate despite their frequent use. Some people will probably take issue with that, but it seems like the goal is ultimately for EA to create a much fairer game. There are a number of improvements to that end listed in the article from Game Informer with bullet points. Firstly, a new section of the playcalling menu called run/pass counter which will let you pick areas of the field where you’re getting beat up. If you move players around though, you’ll have less focusing on another area. That means you’ll still have to pay attention to what your opponent is doing as well. Rather than having four spot drops for defenders, you’ll have eight new zones, and defenders should cover better in them. There are a number of examples in the article, but if you’ve already read about the changes to the AI with Madden 17, then you already know that AI should be much improved this time around, allowing for better defense. Ratings will also play a more important part in the game with Madden 17, with the article offering more insight as to how that will work. Again, if you read the blog posts today, you should already have an idea. Game Informer notes that the developers have been looking at player ratings and tweaking them to fix certain mismatches that have occurred over the years. As an example, cornerbacks seem to have been making too many tackles on power backs. That’s changed. This time around, the development team is looking at the cornerback’s tackle rating and compare it to the other player’s break tackle rating. They also describe the new kicking meter, which they say will function like the traditional 3-click golf swing. This new kicking meter was designed to better account for the ratings of kickers and punters. Block kicks will also be a potential outcome, but the team behind the game is looking closely at the game to make sure that you wouldn’t be able to block more kicks than statistically possible. This is just one of the many ways that EA Tiburon aims to bring Madden closer to the NFL with Madden 17. There are some pretty important physics changes, too. While Madden 16‘s physics made the game more realistic, the physics didn’t always apply to the ball. That’s also changing this year. No longer will the ball snap to a player’s hand during a catch, even though the ball might get pulled through a defender. With the improvements to the ball, there will also be more drops for receivers in traffic. The ball will also bounce differently after tips thanks to a lack of scripting. There will be a number of new animations to accompany that, and player models should track the ball a lot more realistically. Of course, the running game will also be improved, but you should already have an understanding as to how if you’ve been keeping up with the gameplay blog posts. Outside of that, EA is redoing cleats and gloves, as well as offering new sleeve options. It sounds like EA has been listening to player feedback for Madden 17, but is it enough to sell you on the game? Let us know in the comments or on social media.